The Bermuda Triangle, the Lost City of Atlantis, and the Sasquatch are supposedly real based on hearsay and folklore. However until you actually lay eyes on them do they really exist? That’s how I feel about Chez Meme Baguette Bistro. For the longest time this place was a mirage to me. It was there but wasn’t because it only opened between 8am to 3pm Monday to Friday and every second Saturday of the month. So essentially unless you worked near by, didn’t work during regular business hours or don’t work at all, it was almost inaccessible. It was North Burnaby’s little secret. For a brief window, the owners ran a dinner service and I took full advantage to eat the homey French food that was served. However the owners decided to end the supper experiment in December 2012. By far my favourite things on the Chez Meme menu are the sandwiches. The baguette used for all the sandwiches are crispy on the outside with a soft and fluffy interior. I have had the snitzel (pork schnitzel) and the Jarret (lamb). Both were very good, in fact the avatar for my twitter is the Chez Meme lamb sandwich with soup. I was on a mission to try the one sandwich I wanted to try but never got the chance to: the bourguignon sandwich. My attempts to dine at Chez Meme on the second Saturday they were open per month, was always thwarted by a huge line-up in the past. So I woke up early on the second Saturday of the month to ensure I got in this time. 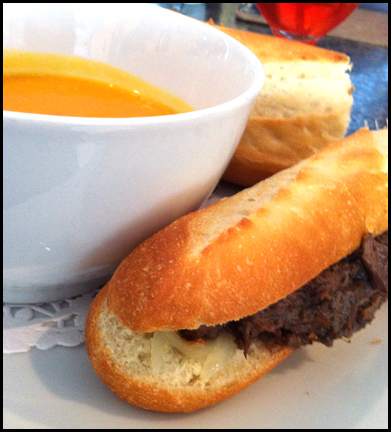 I ordered the bourguignon sandwich with their soup of the day, roasted yam and carrot. The soup was rich, sweet and was fragrant from the roasted the yam. I was impressed with the soup because I normally find carrot soups too sweet for me but this one was balanced. The bourguignon sandwich lived up to my expectations. Just like my previous visits, the baguette was crunchy on the outside but yielded to an airy inside. 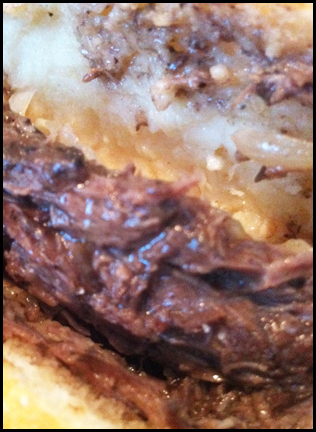 The shredded beef short rib was tender and it was beefy tasting. The sandwich also included softened onion and horseradish, which provided sweetness and a spicy kick. Both condiments made the sandwich more interesting and less monotone. The reason why I was so keen on try the bourguignon sandwich from Chez Meme is it’s a sandwich I simply cannot make easily at home. If I want a sandwich with sliced processed deli meats, I can literally walk 4.5 blocks east to the neighborhood Safeway and purchased the ingredients myself. The Bourguignon (like the Jarret and Snitzel) sandwich is made from ingredients that would take me too long to make at home. The sandwiches from Chez Meme are creations made with care and as result very delicious. FYI: If you attempt to come on the second Saturday of the month and spot an empty table don’t assume it’s available. To help keep the tiny café uncluttered, the owner will take your phone number and call you when your table is ready. It’s not a bad system as you can wander down the street to Valley bakery, Coiffi’s or Red Apple Market to pick up some treats or stock up on some pantry essentials especially if there’s a few party of hungry people ahead of you.